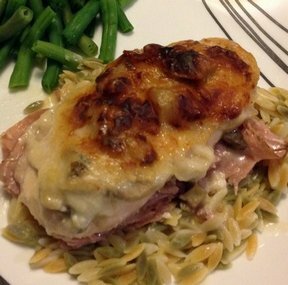 A simpler way to enjoy those wonderful flavors of Chicken Cordon Bleu. 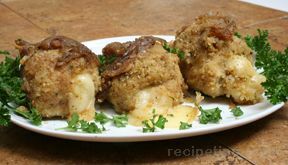 The chicken is covered in a creamy sauce and baked up until moist and tender. Perfect to serve to guests. Place slices of boiled ham in bottom of a greased 9x13-inch pan. Place chicken breast on top of ham, covering bottom of pan. Season with salt, pepper, savory and garlic. Top with sliced mushrooms if desired. 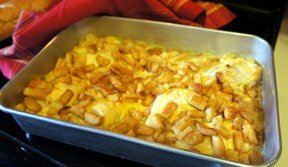 Top chicken with sliced Swiss cheese. Combine cream of mushroom soup, flour, sour cream and white wine. Spread this mixture over the top of the cheese and sprinkle with paprika. 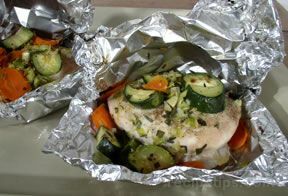 Bake at 325 to 350 degrees F for 60-90 minutes or until chicken is tender. "My sister made this for me when she babysat my kids. It was really good! It would be great over egg noodles for that creamy sauce."